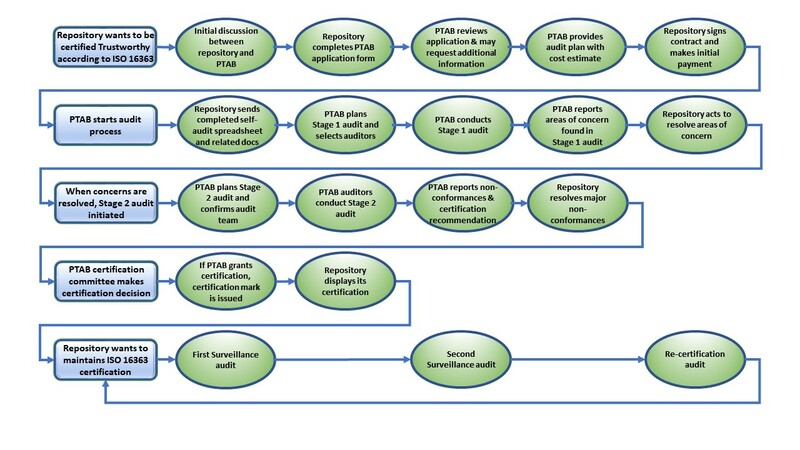 The audit follows the process specified in ISO 17021:2015, supplemented by ISO 16919:2014 and is summarised in the following diagram. competent personnel of the certification body monitor its surveillance activities, including monitoring the reporting by its auditors, to confirm that the certification activity is operating effectively. PTAB will monitor the client’s systems relevant to ISO 16363 certification on a regular basis. other means of monitoring the certified client’s performance. The PTAB surveillance audits will take place on-site. use of marks and/or any other reference to certification. PTAB plans and conducts the recertification audit to evaluate the continued fulfillment of all of the requirements of ISO 16363 to allow a timely renewal before the expiry date of the certificate. The recertification activity will include the review of previous surveillance audit reports and will consider the performance of the management system over the most recent certification cycle. There may need to have a stage 1 if there have been significant changes to the management system, the organization, or the context in which the management system is operating. PTAB will conduct recertification audits of the client. whether the operation of the certified management system contributes to the achievement of the organization’s policy and objectives. These will consider the performance of the management system over the period of certification, and include the review of previous surveillance audit reports. If there have been significant changes in the client’s management system or its context then a stage 1 audit may be required. If nonconformities or lack of evidence are identified PTAB will define time limits for correction and corrective actions to be implemented prior to the expiration of certification. PTAB make decisions on renewing certification based on the results of the recertification audit, as well as the results of the review of the system over the period of certification and complaints received from users of certification.